Buying your first tractor should be a very enjoyable experience, but do your homework first. The month of February brings us Valentine’s Day, and readers of Antique Power magazine will agree that the love-struck experience of buying your first antique tractor remains carved into the memory like a heart on a tree trunk, or in some cases, just a nasty scar. To ensure that a newbie’s initiation into the hobby is more heartwarming than heartbreaking, I asked several knowledgeable collectors to share their tips. Doug Gantvoort has bought, sold, and restored so many tractors over the years that he’s sure he has been in the position of buyer at least 1,000 times. It was he who restored the 1959 Porsche-Diesel Master featured in the March/April issue of Antique Power with owner Steven Young. One question a newbie has to consider is whether to buy at an auction. Gantvoort thinks it can be a good way for a beginner to go. His reasoning is that if you’re bidding on something, but don’t know anything, and two or three other guys are bidding it higher, those guys might know a lot about the tractor being sold. If they didn’t, they wouldn’t be bidding. Les Gitts, whose beautiful 1939 Allis-Chalmers Model B will be featured in Antique Power’s May/June 2015 issue, recommends first examining your intentions—figuring out what you want and why you want it. He likes early tractors for their steel wheels and styling, but your choice might be based on something entirely different, such as nostalgia for a model from your family’s past. He suggests reading reference books about your favorite make before you go shopping. Educate yourself on serial numbers and years. 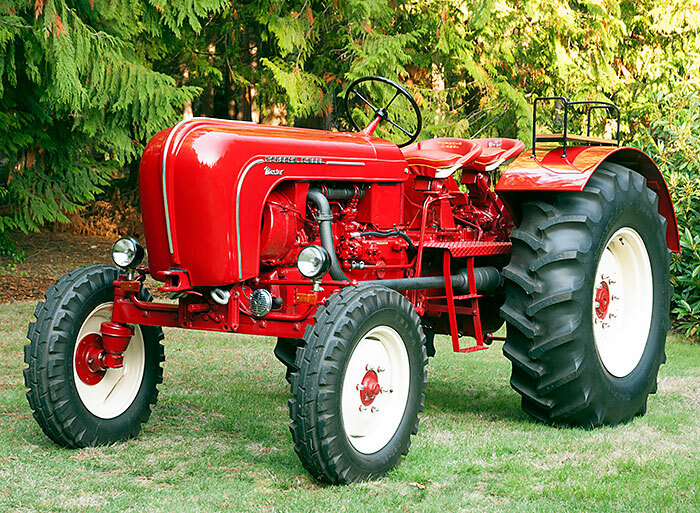 Knowing how a certain tractor should look will alert you to modifications. Al Downs, who owns the 1945 B.F. Avery seen in the January/February 2014 issue of Antique Power, agrees. Set your priorities. Downs gave an example of an inexperienced buyer looking at a completed tractor built between the late 1930s and early 1940s, one needing only normal maintenance, one the buyer intends to drive and show. In that case, the first factor to consider would be tires, which can cost almost as much as the tractor itself—that is, if you can even find them. Echoing Downs’ advice, Gitts recommends looking at the size, then checking with a company such as M.E. Miller Tire to see if they have it, before you commit to buy the tractor. “Nothing’s worse than bringing home something and finding out you can’t even get the rubber to replace what’s on there,” Gitts said. One universal tip is to check the fluids. Obviously, pulling the dipstick and seeing dark oil means it’s past due for a change, but the dipstick can also indicate the presence of water where it doesn’t belong, as Downs explained. Downs also suggested getting a small can and a wrench, crawling under the tractor, and slightly cracking a drain plug. If water is present, it will drain out before the oil. On this same point, Dave King, whose 1967 Case 830 LP appeared in Antique Power’s November/December 2014 issue, pointed out that milky-looking oil indicates water. If it’s in the transmission, it could be due to condensation from sitting through hot-and-cold temperature cycles, but if it’s in the engine, you might have a bad head gasket or cracked block or head. Observe the smoke coming out of the stack. Intermittent exhaust coming out of the stack, he told me, indicates a burned valve. Listen for a knock deep in the crankcase. Noises, however, can be tricky to diagnose. That’s what happened to Fred Moses. When he tore into both his John Deere 60 Standard and a Farmall Cub, he discovered many unseen problems, including a horribly corroded carburetor. He also shared photos of what water did to a manifold when it infiltrated the engine through the exhaust. When it comes to the electrical system, does the tractor have a magneto, a distributor, or a magneto with a generator to power work lights and headlights? Back in the early days, wiring wasn’t too durable. Frayed wiring needs to be replaced before it grounds out and damages the generator or regulator. Gitts warned that if the wiring has a lot of black electrical tape all over the place, or if all the wires you see are the same color, those are both bad signs. It means someone went in there and replaced wire for some reason, and if they didn’t use the original colors, you won’t know what’s what. If you can, find out if the tractor was painted with lacquer, enamel, acrylic enamel, or a polyurethane. With cheap paint, even mild cleaners could damage the shiny finish. He warned that some sellers simply dont have the knowledge to realize what may be wrong with the tractor, so they cant answer certain questions. On the other hand, even the most honest seller can just plain forget to mention a couple of small flaws. After the search comes the business transaction. Most of the time, things go well, but even Gantvoort, an expert buyer, recalls a bad experience. He only uses the PayPal online payment system for eBay purchases now, but once paid $3,500 in advance for a tractor he saw on the site. Two months later, when he traveled to the seller’s location to bring it home, he was told that someone had already picked it up! Yet he points out that this was a rarity. King ran into a problem when he handed someone the cash, only to have them later dispute the amount. It ended up costing him an extra $100 because he couldn’t prove what he knew he’d given, after counting it privately three times. In spite of these warnings, all of the men I spoke with believe in the inherent goodness and honesty of almost all tractor collectors, who are known to be kind, gracious, and helpful to newbies. So, why not celebrate Valentine’s Day by taking a chance on tractor love? Remember—unlike a romance with another human being, if things don’t work out, you can always sell off the parts! Fred Moses is currently working on this Cub.